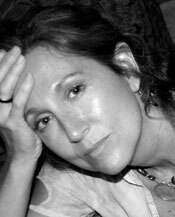 Jodi Barnes is a poet and writer in Cary, North Carolina. She has a PhD from The University of Georgia and has taught graduate and undergraduate students all facets of human resource management, ethics, leadership and change management at three Research I universities. She has also been a journalist, an HR manager and a consultant. When she is not writing, Jodi helps teens understand how group identity (e.g., race, ethnicity, gender) differences and commonalities enrich confidence and competency. She has been a writer-in-residence for Wake County schools for the past two years. Her favorite author is Tom Robbins and her favorite teachers are her daughters Sarah, Ali and RaeAnna, and her aiding/abetting husband, JB Maddox. Jodi has moved households 24 times–that she can remember. Three of her poems are featured in the Fall 2010 issue Iodine Poetry Journal. In her first poetry collection, Jodi Barnes takes the reader on what seems like a bittersweet series of moves and wanderings, as she both examines and muses on the mundane and the spiritual… the ordinary and the extraordinary… reality and myth. With the observation and bite of Anne Sexton and Sharon Olds, and the wit and softness of Kay Ryan and Mary Oliver, Jodi Barnes evokes the pain and joy of transition, the familiar clutter of the uprooted, and the restlessness most of us feel when we’re packing and unpacking in our search for meaning through the impermanence of life, while moving from one place to another. She declares, “I don’t believe in God,” yet “Thank(s) whatever god you, my goddess will, ” while affirming, “My core seeks root in clay.” Read this collection and find yourself engaged with this poet, seeking where you, yourself should be rooted. of a life that might be saved. I’m knee-deep in random evidence. against moth, rust and thieves. How much is enough to keep? But this is not their life. desire — its flapping door. Be the first to review “Unsettled” Click here to cancel reply.